I’m ready to be found on page one. There’s no magic formula for overnight SEO success. BUT... there are proven ways you can amplify your online visibility and even secure the coveted #1 position on Google and other search engines. 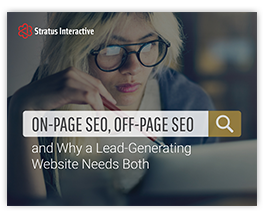 Our brand new guide, On-Page SEO, Off-Page SEO and Why A Lead-Generating Website Needs Both, will show you how to leverage the combined power of critical SEO components and improve your search engine rankings. Fill out the form to download your guide — it’s an easy first step to finally being found online.